eRecipeCards.com is a place for home cooks to share their recipes and accomplishments. Submissions are welcome from any blogger with a recipe to share. But, submissions will be moderated. Please, submissions from home cooks only. No submissions of magazine articles or book photos. Working professional chefs are welcome to submit, but please make the recipes accessible to home cooks. Original work only. Do not submit the glory of another's work as your own. However, if you adapt a recipe from TV, Books or magazines, as long as you credit an "inspired by" notice, we would love to accept it. Photos should be submitted as square images. There are many easy to use FREE applications that make cropping and resizing photos easy. If you do not have one that you already use, give google's PICASSA a try. They have a terrific button labeled "Feeling Lucky" that automatically adjusts color and light balance. PICASSA also makes cropping to a square image easy. Photos must be submitted a minimum of 250 X 250 pixels. We will resize anything submitted larger than 250 X 250 to the smaller size, but we can not resize smaller photos larger. There are many sites that encourage taking beautifully staged magazine quality images. While that should be a goal for all food bloggers, eRecipeCards.com is not limited to accepting only magazine quality images. There will be a minimum standard (well lit (flash photos will be accepted), in focus, no cluttered background), but we will be inclusive. While others brag of over 1,000 submissions in a day and less than 100 accepted, we will aim for 1,000 submissions and less than 10 rejected. eRecipeCards.com is meant to be a place to find the work of home cooks/food bloggers. Rejecting that work because of arbitrary standards does not build for a consistent community. By visiting eRecipeCards.com or using any portion of the benefits of the site or any content or services on the site, you agree to follow these terms and conditions. If you do not agree to all the terms and conditions, then please do not attempt to be a part of the community of contributors. Non registered visitors may view the accepted submissions of the membership, follow the links to the original full post and use the "search" function. Only registered members may make submissions to be included in the list of blog posts. Only registered members may submit blog posts to be included in the "search" function. Only registered members can build an individual "Recipe Box" of favorite submissions. 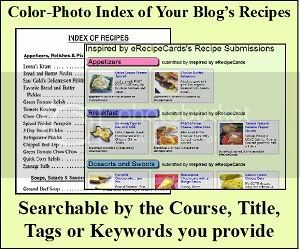 If you do not write a blog, nor plan to submit a post, you still must register if you would like to build an individual "Recipe Box" of favorite submissions. Please register In order to take full advantage of all the features of eRecipeCards.com. Registered members and visitors are prohibited from using the features of eRecipeCards.com for illegal or unethical purposes. Definition of unethical will be at the sole discretion of eRecipeCards.com. You must be the author of the submitted post. Please do not submit another blogger's work. The photo that you submit must be an original photo owned by the person submitting. Be a good neighbor. Treat this virtual neighborhood like you would if you were living here. Be polite, say thank you and please. Encourage your virtual friends and rejoice when new neighbors move in. What your mother taught you is true: to have friends, be a friend. If you have an issue with the content on the site, please email contact@erecipecards.com.